shishebori, D. (2016). Reliable multi-product multi-vehicle multi-type link logistics network design: A hybrid heuristic algorithm. Journal of Industrial and Systems Engineering, 9(1), 92-108. Davood shishebori. "Reliable multi-product multi-vehicle multi-type link logistics network design: A hybrid heuristic algorithm". Journal of Industrial and Systems Engineering, 9, 1, 2016, 92-108.
shishebori, D. (2016). 'Reliable multi-product multi-vehicle multi-type link logistics network design: A hybrid heuristic algorithm', Journal of Industrial and Systems Engineering, 9(1), pp. 92-108.
shishebori, D. Reliable multi-product multi-vehicle multi-type link logistics network design: A hybrid heuristic algorithm. Journal of Industrial and Systems Engineering, 2016; 9(1): 92-108. This paper considers the reliable multi-product multi-vehicle multi-type link logistics network design problem (RMLNDP) with system disruptions, which is concerned with facilities locating, transshipment links constructing, and also allocating them to the customers in order to satisfy their demand on minimum expected total cost (including locating costs, link constructing costs, and also expected transshipment costs in normal and disruption conditions). The motivating application of this class of problem is in multi-product, multi-vehicle, and multi-type link logistics network design regarding to system disruptions simultaneously. In fact, the decision makers in this area are not only concerned with the facility locating costs, link constructing costs, and logistical costs of the system but also by focusing on the several system disruptions states in order to be able to provide a reliable sustainable multi configuration logistic network system. All of the facility location plan, link construction plan and also link transshipment plan of the demands in the problem must be efficiently determined while considering the several system disruptions. The problem was modeled as a MIP. Also, a hybrid heuristic, based on LP relaxation approach, is proposed. Computational experiments illustrate that the provided algorithm will able to substantially outperform the proposed integer programming model in terms of both finding and verifying the efficient optimal (or near optimal) solution at a reasonable processing time. Aboolian, R., Cui, T., and Shen, Z.-J. M. (2012). "An Efficient Approach for Solving Reliable Facility Location Models." INFORMS Journal on Computing, 25(4), 720-729. Ahmed, S., and Shapiro, A. (2002). "The sample average approximation method for stochastic programs with integer recourse." Optimization Online, http://www.optimization-online.org. Amrani, H., Martel, A., Zufferey, N., and Makeeva, P. (2011). "A variable neighborhood search heuristic for the design of multicommodity production-distribution networks with alternative facility configurations." OR Spectrum, 33(4), 989-1007. Aydin, N., Murat, A. (2013). "A swarm intelligence based sample average approximation algorithm for the capacitated reliable facility location problem." International Journal of Production Economics, 145(1), 173-183. Azizi, N., Chauhan, S., Salhi, S., and Vidyarthi, N. (2014). "The impact of Hub failure in Hub-and-spoke Networks: Mathematical Formulations and solution techniques." Computers & Operations Research, In press. Badri, H., Bashiri, M., and Hejazi, T. H. (2013). "Integrated strategic and tactical planning in a supply chain network design with a heuristic solution method." Computers & Operations Research, 40(4), 1143-1154. Bashiri, M., Badri, H., and Talebi, J. (2012). "A new approach to tactical and strategic planning in production-distribution networks." Applied Mathematical Modelling, 36(4), 1703-1717. Berman, O., Krass, D., and Menezes, M. B. C. (2007). "Facility reliability issues in network p-median problems: Strategic centralization and co-location effects." Operations Research, 55(2), 332. Berman, O., Krass, D., and Menezes, M. B. C (2010). "Location problems with two unreliable facilities on a line allowing correlated failures." Working Paper, Rotman School of Management, University of Toronto, Toronto, Ontario, Canada. Cachon, G. (1999). "Competitive and cooperative inventory management in a two-echelon supply chain with lost sales." Fuqua School of Business, Duke University, Durham, NC. Caldentey, R., and Wein, L. M. (2003). "Analysis of a decentralized production-inventory system." Manufacturing & Service Operations Management, 5(1), 1-17. Cardona-Valdes, Y., Alvarez, A., and Pacheco, J. (2014). "Metaheuristic procedure for a bi-objective supply chain design problem with uncertainty." Transportation Research Part B: Methodological, 60, 66-84. Chen, C.-L., and Lee, W.-C. (2004). "Multi-objective optimization of multi-echelon supply chain networks with uncertain product demands and prices." Computers & Chemical Engineering, 28(6), 1131-1144. Cui, T., Ouyang, Y., and Shen, Z. J. M. (2010). "Reliable facility location design under the risk of disruptions." Operations Research, 58(4-Part-1), 998-1011. Daskin, M. S., Snyder, L. V., and Berger, R. T. (2005). "Facility location in supply chain design." Logistics systems: Design and optimization, Springer, 39-65. Drezner, Z. (1987). "Heuristic solution methods for two location problems with unreliable facilities." Journal of the Operational Research Society, 38(6), 509-514. Duan, Q., and Liao, T. W. (2013). "Optimization of replenishment policies for decentralized and centralized capacitated supply chains under various demands." International Journal of Production Economics, 142(1), 194-204. El-Sayed, M., Afia, N., and El-Kharbotly, A. (2010). "A stochastic model for forward-reverse logistics network design under risk." Computers & Industrial Engineering, 58(3), 423-431. Esmaeilikia, M., Fahimnia, B., Sarkis, J., Govindan, K., Kumar, A., and Mo, J. (2014). "Tactical supply chain planning models with inherent flexibility: definition and review." Annals of Operations Research, 1-21. Ferrio, J., and Wassick, J. (2008). "Chemical supply chain network optimization." Computers & Chemical Engineering, 32(11), 2481-2504. Ferris, M. C., Ruszczynski, A. (2000). "Robust path choice in networks with failures." Networks, 35:200–18. Garcia-Herreros, P., Wassick, J. M., and Grossmann, I. E. (2014). "Design of Resilient Supply Chains with Risk of Facility Disruptions." Industrial & Engineering Chemistry Research, 53(44), 17240-17251. Gupta, D., and Selvaraju, N. (2006). "Performance evaluation and stock allocation in capacitated serial supply systems." Manufacturing & Service Operations Management, 8(2), 169-191. Haldar, A., Ray, A., Banerjee, D., and Ghosh, S. (2014). "Resilient supplier selection under a fuzzy environment." International Journal of Management Science and Engineering Management, 9(2), 147-156. Hatefi, S. M., Jolai, F., Torabi, S. A., and Tavakkoli-Moghaddam, R. (2014). "A credibility-constrained programming for reliable forward-reverse logistics network design under uncertainty and facility disruptions." 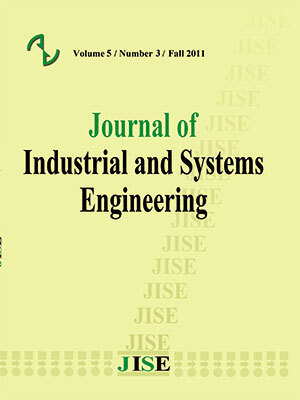 International Journal of Computer Integrated Manufacturing, 28(6), 664-678. Hatefi, S. M., & Jolai, F., (2015). Reliable forward–reverse logistics network design under partial and complete facility disruptions. International Journal of Logistics Systems and Management, 20(3), 370-394. Hennet, J.-C., and Arda, Y. (2008). "Supply chain coordination: A game-theory approach." Engineering Applications of Artificial Intelligence, 21(3), 399-405. Ivanov, D., Pavlov, A., and Sokolov, B. (2014). "Optimal distribution (re) planning in a centralized multi-stage supply network under conditions of the ripple effect and structure dynamics." European Journal of Operational Research, 237(2), 758-770. Jabbarzadeh, A., Jalali Naini, S. G., Davoudpour, H., and Azad, N. (2012). "Designing a Supply Chain Network under the Risk of Disruptions." Mathematical Problems in Engineering, 12, DOI:10.1155/2012/234324. Jamshidi, R., Fatemi Ghomi, S. M. T., and Karimi, B. (2012). "Multi-objective green supply chain optimization with a new hybrid memetic algorithm using the Taguchi method." Scientia Iranica, 19(6), 1876-1886. Jemai, Z., and Karaesmen, F. (2007). "Decentralized inventory control in a two-stage capacitated supply chain." IIE transactions, 39(5), 501-512. Kleywegt, A. J., Shapiro, A., and Homem-de-Mello, T. (2002). "The sample average approximation method for stochastic discrete optimization." SIAM Journal on Optimization, 12(2), 479-502. Klibi, W., Martel, A., Guitouni, A.,. (2009). "The design of robust value-creating supply chain networks: a critical review." Working paper, CIRRELT, Center interuniversitaire de recherche. Liberatore, F., Scaparra, M. P., and Daskin, M. S. (2012). "Hedging against disruptions with ripple effects in location analysis." Omega, 40(1), 21-30. Lim, M., Daskin, M.S., Bassamboo, A., and Chopra, S. (2009). "Facility location decisions in supply chain networks with random disruption and imperfect information." Working paper,” Department of Business Administration, University of Illinois. Magnanti, T. L., and Wong, R. T. (1984). "Network Design and Transportation Planning: Models and Algorithms." Transportation Science, 18(1), 1-55. Mahajan, J., Radas, S., and Vakharia, A. J. (2002). "Channel Strategies and Stocking Policies in Uncapacitated and Capacitated Supply Chains" Decision Sciences, 33(2), 191-222. Meixell, M. J., and Gargeya, V. B. (2005). "Global supply chain design: A literature review and critique" Transportation Research Part E: Logistics and Transportation Review, 41(6), 531-550. Mirzapour Al-E-Hashem, S. M. J., Malekly, H., and Aryanezhad, M. B. (2011). "A multi-objective robust optimization model for multi-product multi-site aggregate production planning in a supply chain under uncertainty." International Journal of Production Economics, 134(1), 28-42. Nepal, B., Murat, A., and Babu Chinnam, R. (2012). "The bullwhip effect in capacitated supply chains with consideration for product life-cycle aspects" International Journal of Production Economics, 136(2), 318-331. O’Hanley, J. R., and Church, R. L. (2011). "Designing robust coverage networks to hedge against worst-case facility losses" European Journal of Operational Research, 209(1), 23-36. Owen, S. H., and Daskin, M. S. (1998). "Strategic facility location: A review" European Journal of Operational Research, 111(3), 423-447. Park, B. J., Choi, H. R., and Kang, M. H. (2007). "Integration of production and distribution planning using a genetic algorithm in supply chain management" Analysis and Design of Intelligent Systems using Soft Computing Techniques, Springer, 416-426. Pasandideh, S. H. R., Niaki, S. T. A., and Asadi, K. (2014). "Bi-objective optimization of a multi-product multi-period three-echelon supply chain problem under uncertain environments: NSGA-II and NRGA" Information Sciences. Peng, P., Snyder, L. V., Lim, A., and Liu, Z. (2011). "Reliable logistics networks design with facility disruptions" Transportation Research Part B: Methodological, 45(8), 1190-1211. Sarrafha, K., Rahmati, S. H. A., Niaki, S. T. A., and Talab, A. Z. (2014). "A Bi-objective integrated procurement, production, and distribution problem of A multi-echelon supply chain network design: A new tuned MOEA" Computers & Operations Research, 54(2015), 35-51. Schutz, P., Tomasgard, A., and Ahmed, S. (2009). "Supply chain design under uncertainty using sample average approximation and dual decomposition" European Journal of Operational Research, 199(2), 409-419. Sever, D., Dellaert, N., van Woensel, T., and de Kok, T. (2013). "Dynamic shortest path problems: Hybrid routing policies considering network disruptions" Computers & Operations Research, 40(12), 2852-2863. Shen, Z.-J. M., Zhan, R. L., and Zhang, J. (2011). "The reliable facility location problem: Formulations, heuristics, and approximation algorithms" INFORMS Journal on Computing, 23(3), 470-482. Sherali, H. D., and Alameddine, A. (1992). "A new reformulation-linearization technique for bilinear programming problems" Journal of Global Optimization, 2(4), 379-410. Shishebori, D., Jabalameli, M. S., and Jabbarzadeh, A. (2013). "Facility Location-Network Design Problem: Reliability and Investment Budget Constraint." Journal of Urban Planning and Development, DOI: 10.1061/(ASCE)UP.1943-5444. 0000187. Shishebori, D., Snyder, L. V., and Jabalameli, M. S. (2014). "A reliable budget- constrained facility location/network design problem with unreliable facilities." Networks and Spatial Economics, DOI 10.1007/s11067-014-9254-6. Shishebori, D., and YousefiBabadi, A., (2015). "Robust and reliable medical services network design underuncertain environment and system disruptions", Transportation Research: Part E: Logistics and transportation review. 77 :268–288. Sitompul, C., Aghezzaf, E.-H., Dullaert, W., and Landeghem, H. V. (2008). "Safety stock placement problem in capacitated supply chains." International Journal of Production Research, 46(17), 4709-4727. Snyder, L. V. (2003). "Supply chain robustness and reliability: Models and algorithms (PHD Thesis)," Northwestern University, Evanston, IL,. Snyder, L. V., Atan, Z., Peng, P., Rong, Y., Schmitt, A. J., and Sinsoysal, B. (2012). "OR/MS models for supply chain disruptions: A review." SSRN eLibrary. Snyder, L. V., and Daskin, M. S. (2005). "Reliability models for facility location: The expected failure cost case." Transportation Science, 39(3), 400-416. Snyder, L. V., and Daskin, M. S. (2007). "Models for reliable supply chain network design." Critical Infrastructure : Reliability and Vulnerability, A.T. Murray and T.H. Grubesic, , Chapter 13, 257-289. Snyder, L. V., Scaparra, M.P., and Daskin, M. S., Church, R.L. (2006). "Planning for disruptions in supply chain networks." Tutorials in Operations Research: Models, Methods, and Applications for Innovative Decision Making, ISBN: 13 978-1-877640-20-9(DOI 10.1287, 234–257. Soleimani, H., & Kannan, G. (2015). "A hybrid particle swarm optimization and genetic algorithm for closed-loop supply chain network design in large-scale networks" Applied Mathematical Modelling, 39(14), 3990-4012. Song, D.-P., Dong, J.-X., and Xu, J. (2014). "Integrated inventory management and supplier base reduction in a supply chain with multiple uncertainties." European Journal of Operational Research, 232(3), 522-536. Soni, S., Pirkul, H. (2000). "Design of survivable networks with connectivity requirements." Telecommunication Systems 20 (1–2), 133–149. Toktas-Palut, P., Fusun., U. (2011). "Coordination in a two-stage capacitated supply chain with multiple suppliers." European Journal of Operational Research, 212(1), 43-53. Waller, S. T., Ziliaskopoulos, A.K. (2002). "On the online shortest path problem with limited arc cost dependencies." Networks;40(4):216–27. You, F., and Grossmann, I. E. (2008). "Design of responsive supply chains under demand uncertainty." Computers & Chemical Engineering, 32(12), 3090-3111.